I love the Bennett. Looks great! That dress is absolutely gorgeous! The colors and pattern makes me madly want it. Does it have pockets?? fabulous dress! love the bright colors! I love this dress! Such a fun color and print! that dress is structurally stunning! I did not know Foley and Corinna had a clothing line! Love this dress!! You look fabulous!! Very feminine and trendy outfit! I like this dress a lot! that dress is beautiful! Loving the colors. Interesting patterns on the dress! Dang woman! This dress is AMAZING on you! And that necklace is gorg! very pretty dress! and the necklace is beautiful! Such a gorgeous dress - love the print/solid mix and the structure! So in love with this dress Krystal! Love that dress and those necklaces! So fab, and I love how you've layered the necklaces! Love the dress and how feminine it is even though its neoprene! Gorgeous print, I love it with the Zara shoes! Stilish dress, it fits amazingly on you! That is a gorgeous dress and it looks so good on you. Love the necklace! 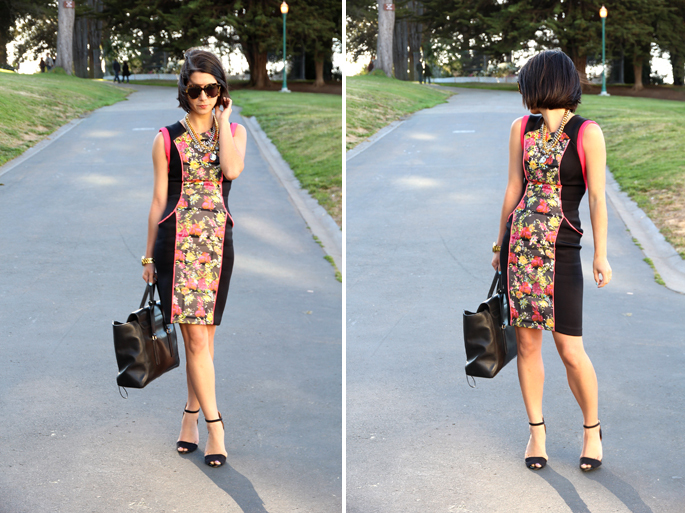 The neon piping of the dress provides such a great detail to the floral print! needless to say, I'm in love with your styling here. Gorgeous dress alone but also looks great on you! That dress is an absolute gem! i love love this dress on you krystal! it is so perfect - you look amazing (as always). Oh that dress is absolutely gorgeous on you! SUCH a stunning dress! and so fun, too! Wow, you look absolutely stunning! Love the dress! So beautiful! Love the bold chain necklaces with the bold print dress, so chic! The design of the dress is ingenious... It accentuates the waist and cinches it in to appear smaller while putting the attention on the lovely garden of flowers mid center! Lovely! And you wear it well! You are WEARING that dress girl.....and of course, love the infamous Zara shoes! Cool dress! Have a great weekend!